Do you regularly record project details? 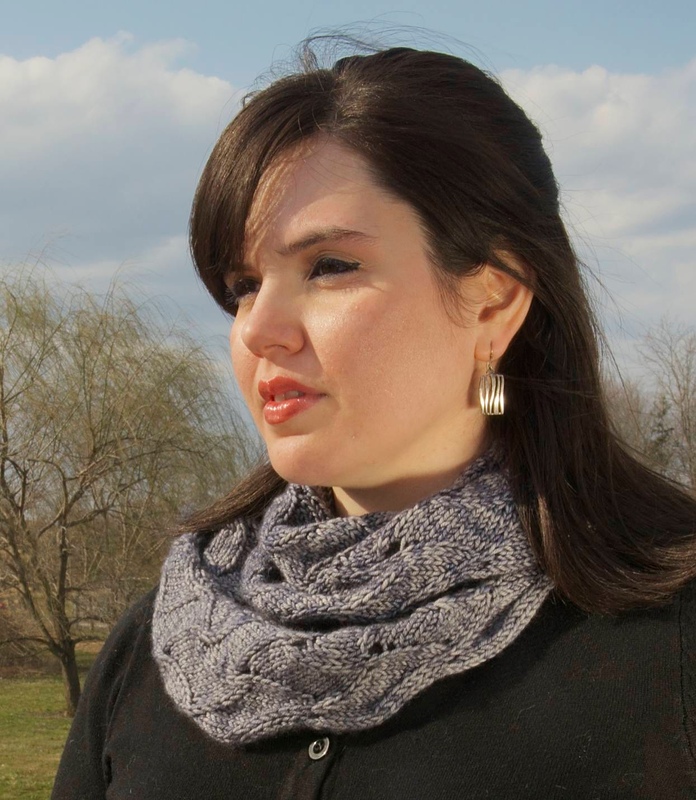 Think you'll remember the needle size you used to knit that sweater you just finished? What about the project to set aside last week? Or how about that hat you made last year? Doubtful. Highly doubtful. If you knit or crochet and are part of the Ravelry community, one feature of the site is a customizable project section to record relevant details on projects. Your personal project page has spaces for the essentials--yarn used and how much, needle size, pattern source and size, as well as the important text box for notes. There are many other details, most of which are 'nice-to-have's' and helpful to others interested in the item, but these are the most important in my opinion. 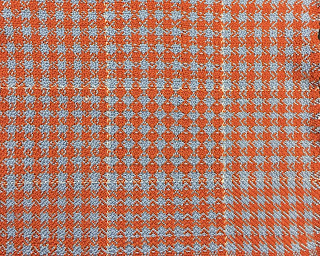 Weavers have an online resource at Weavolution, but it's neither as clean nor as easy to use as the "add project" page on Ravelry. I did find a good thread regarding records sheets there. A number of group members recommend record sheets found in popular weaving books and point out that many current weaving software programs include record keeping templates. 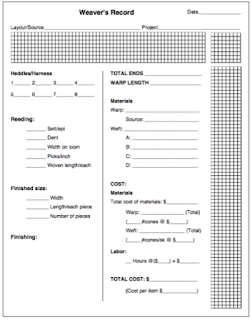 Some guilds have developed and/or adapted record sheets and make them available for download from their website. For example, the Handweavers Guild of Boise Valley (Idaho) has weaving, spinning, dyeing and braiding records. They also have developed a weaver's Project Planner in Excel for a project, but it does not include the drawdown or calculations. 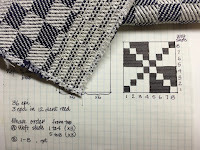 Use their Weaving Record, Weaving Record Drawdown and Weaving Yarn Calculation for the range of data needed. 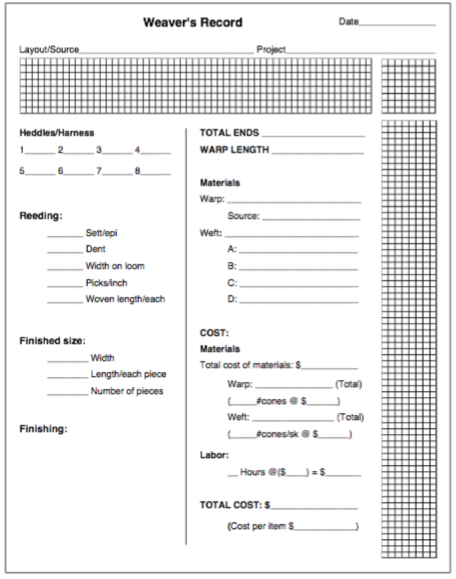 For weaving I use a record sheet (above) that suits my personal needs. 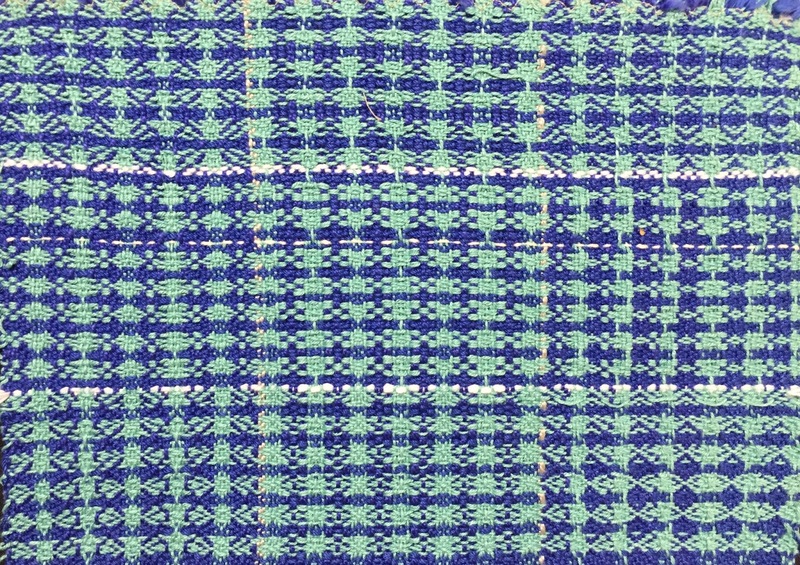 It's really a combination of the Boise' Guild's Project Planner, standard weaving record sheets and drawdowns and is closer to the weaving record sheet offered by the Williamsburg Spinners & Weavers Guild, accessible here. 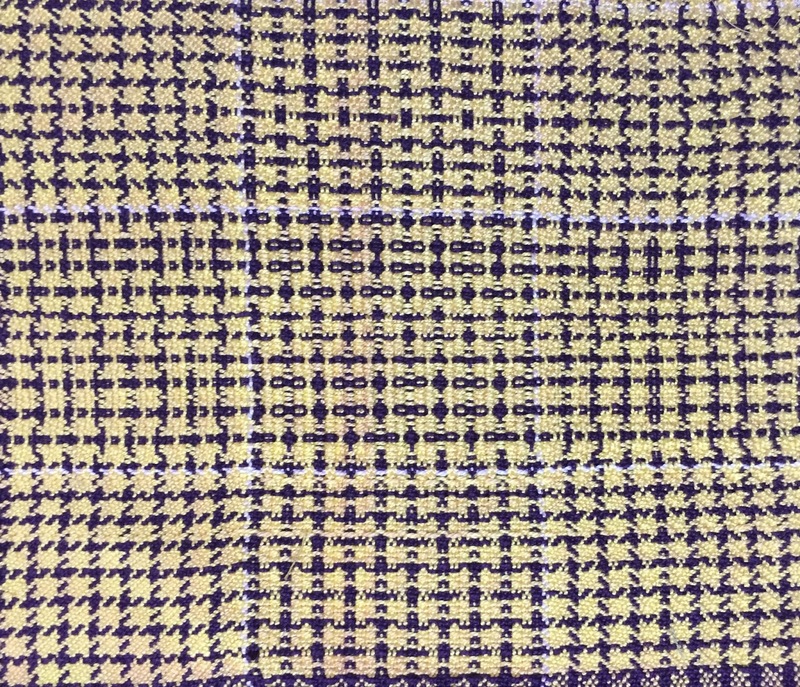 For spinning, dyeing and braiding, I prefer to make records on 4x6 index cards. I make a master with the relevant information I want to capture and print it on blank cards. Of course, I update the master regularly, but having a master makes it as easy as possible to enter the data as well as to use it later. Please oh please document your work. 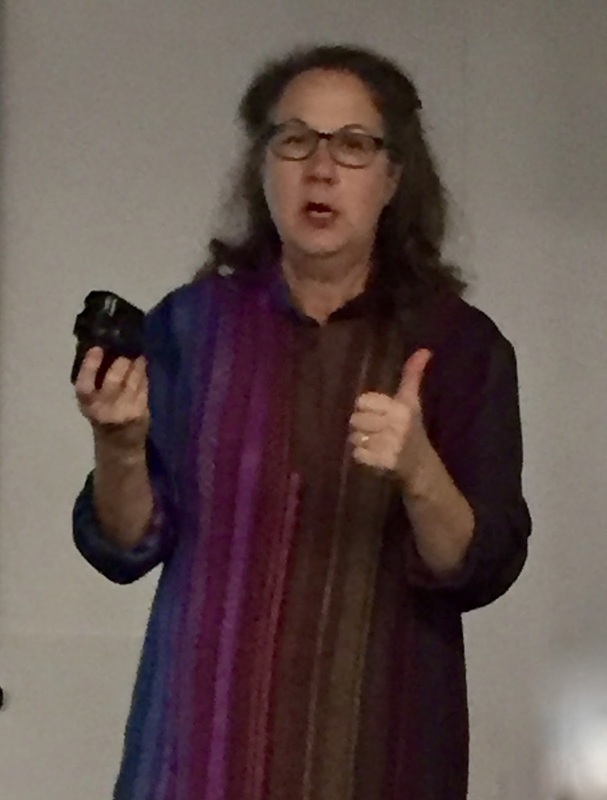 Documented work has value not only to you, but also to others. 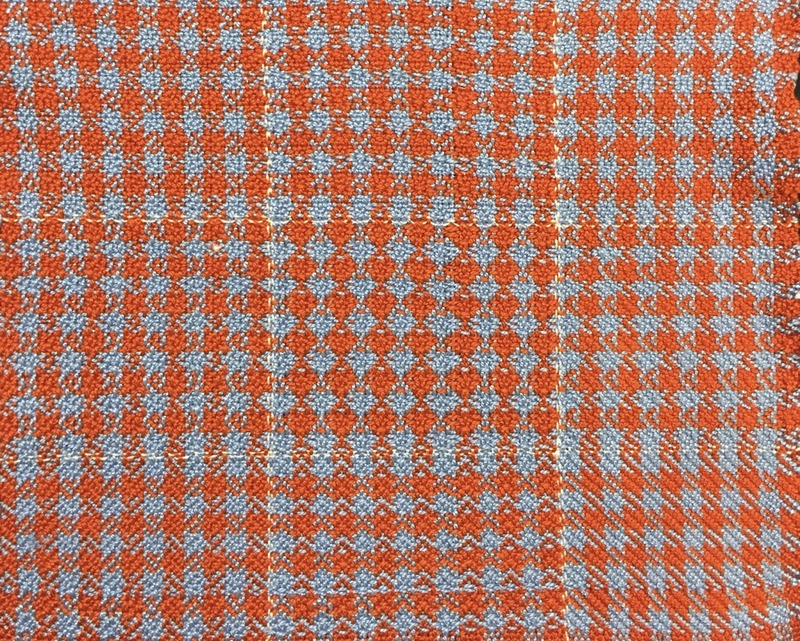 The New York Guild of Handweavers has an impressive collection of weaving samples. Unfortunately, many are missing documentation. No names. No weave structure. No threading or treadling guides. They aren't much good as a resource....yet. The Guild has begun a study group to identify the patterns. It is a huge task. Whether you download a form, make your own template, or keep a spiral notebook doesn't matter. The thing that matters isn't the method. It's the documentation. And, oh yes! Be sure to photograph your work and attach it to the document. It's your body of work. It is important. 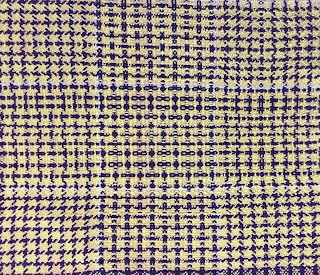 By now you know that I love beautiful textiles. But the love sometimes surpasses practicality and/or timeliness. Such is the case of three discarded beauties. The textiles were remarkable but sadly they had outlived their intended uses. One, which I bought at an auction, was red and a very large square paisley shawl woven of fine silk and wool, ca. 1860. 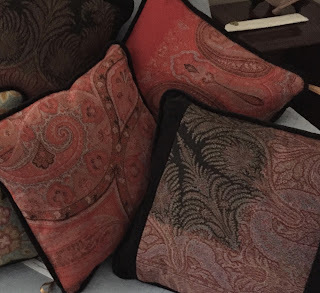 Its plain weave red center, visible on the top center pillow, was bordered with intricately woven designs on all four sides. The second called to me at a yard sale. 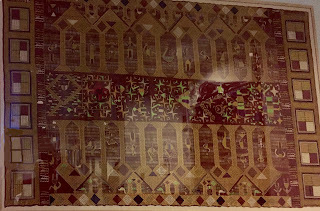 The large Kashmir wool chain stitch embroidery wall hanging had been badly damaged at its midpoint where it had clearly been folded for a long period of time. (A sad reminder never to fold valuable textiles--Roll them up!) I estimate that it was made in the late first to mid-second quarter of the 20th century. 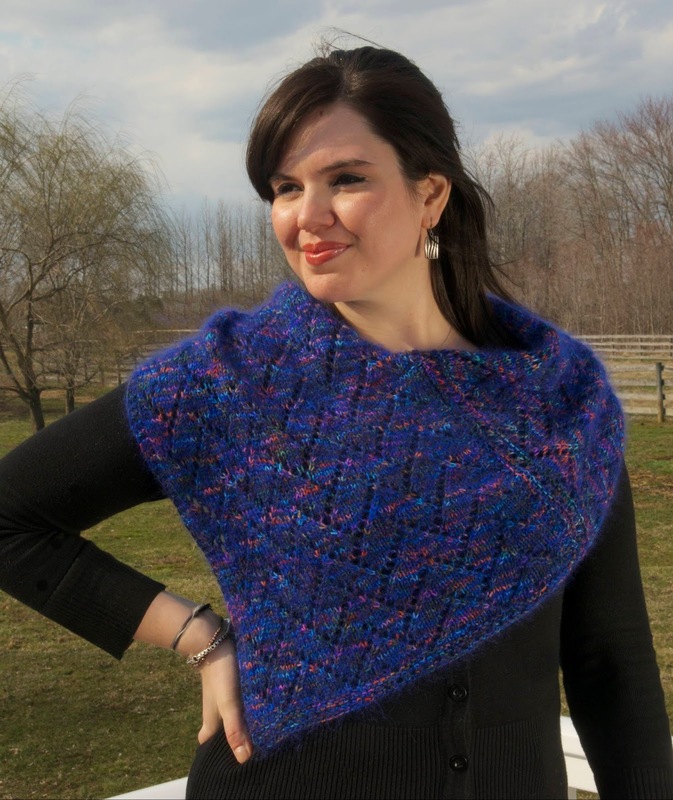 The third textile consisted of two rectangular sections of a wool paisley shawl. I don't remember where I got them, but they're circa late 19th to very early 20th century. 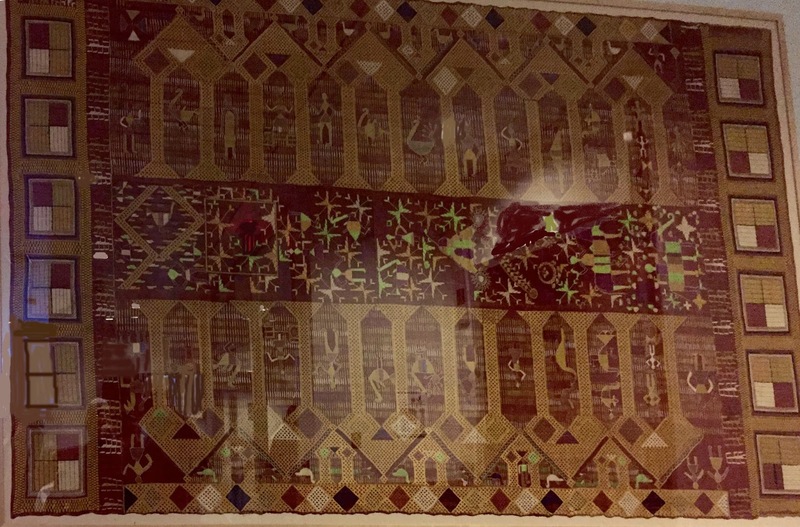 The pieces were in good condition and showed the original shawl's solid black center as well as its lovely deep, rich red and dark green intricately woven border design. They were undamaged but only 12 inches wide. Despite the damaged areas on the red shawl and the Kashmir embroidery, there were plenty of areas in good condition. The colors were vibrant and designs exquisite. 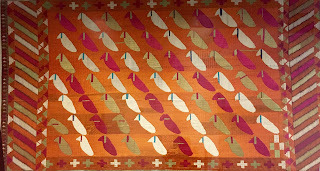 Beautiful textiles to live with and enjoy. I could envision them as pillows. Unfortunately, as often happens, my mind provides more ideas and warps time to cause me to think I can achieve more than humanly possible. I tend to live in this state. So, after a life change early in 2015, followed by a studio clean-up and -out, a major goal was to finish neglected projects. 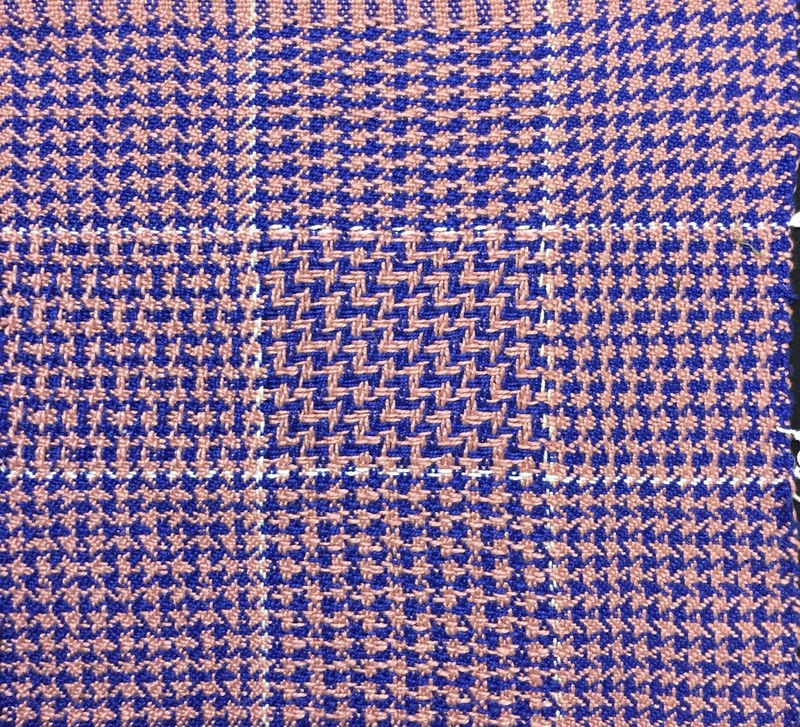 The three textiles were at the top of the list. They occupied valuable space. I needed them finished and out the door! Then I got a deadline. (Yes, yes. I'm very deadline-driven.) K. had a booth at a local craft fair and offered to share it with me. This gave me a date to finish them. I loved the textiles when the only thing to love was the intricate and beautiful work--and I love them even more as beautiful pillows. But I can't possibly use all the pillows I have, so, yes, they're for sale. Time and place yet to come. 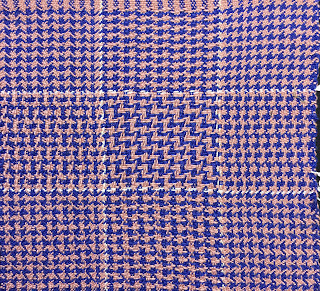 I didn't expect to find textiles on the walls at the Curtis Institute of Music, but there they were. Beautiful. And I hadn't even noticed them when entering the recital hall. A fit of coughing caused me to miss the last performer and the encore of the Opera Philadelphia recital, but the near empty reception area gave me space to notice the pulcharis. First one. Then more! The large rectangular wall hangings are from the Jill and Sheldon Bonovitz Collection. 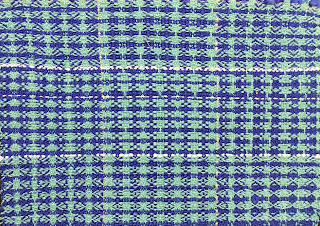 Embroidered in rich, vibrant colors the pulcharis are unique to the Punjab and worked in a technique also known as pulchari, or flowering work. The stitched designs represent good fortune, health and happiness, according to the information signage accompanying the works. Worked from the back in brightly dyed, untwisted silk floss, pulcharis feature floral and geometric patterns and were made during the 19th century and well into the 20th by Punjabi women of all backgrounds and religions. According to information posted with the pulcharis, they were commonly worn as head coverings by the women for special rituals and events. (The Minneapolis Museum of Art has a particularly beautiful 19th century pulchari veil made of camel hair and gold thread.) Also, some pulcharis were made to celebrate a special occasion, such as a marriage or a birth. And others were made for temple offerings or ritual wall hangings or canopies. In the Punjab, women began stitching for a woman's trousseau--for a girl--or as a gift to the groom's parents for a boy. 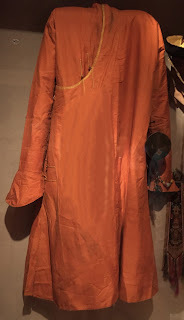 Folk songs and stories record that dreams and desires of the woman were stitched into the pulcharis, which may account for subtle changes in the work throughout the time it was being crafted. It was a treat to stumble upon this group of generously shared pulcharis. And it was a reminder for vigilance. Beauty surrounds us, if only we take the time to look. Genghis Khan.The name alone invokes warfare and power. From the steppes of Mongolia, so it is said, hordes of Mongols swept south and west to conquer. And conquer most of Eurasia, they did. An exhibit, Genghis Khan: Bring the Legend to Life, currently at the Franklin Institute in Philadelphia tells the tale and includes some rather incredible artifacts, almost all of which are from private collections. It would be of interest to know where. 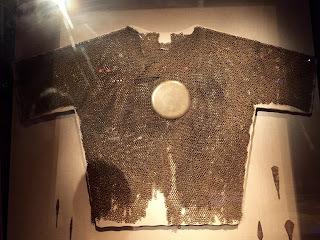 Among the many treasures, we were particularly impressed with the sword attributed as a gift from Marco Polo, but since this blog focuses on textiles, I'll stick to the wealth in that realm. Textiles are a common thread throughout the exhibit and begins at the entrance where a cut-away gur (or ger) provides a view of traditional Mongolian nomad living quarters. Also known as yurts, these portable tent-like structures consist of a wooden frame with felt cover and sides. Beautiful rugs cover the floor. Mongolian spinning weights. Drop spindle replica (left). 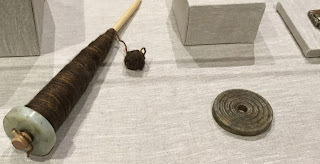 I find early textile tools intriguing and these jade spinning disks, which formed the weight for drop spindles, are no exception. The white jade disk, which is part of a drop spindle replica, is 2,000 years old. The disk on the right, a mere 7,000 years old. Even the structure of Mongolian armor is appealing. In the fragmented mesh armor, at right, I can see a contemporary knit--a sweater or a jacket. Although the warrior garments are interesting, I find traditional costumes more interesting for their colors and patterns. The traditional woman's costume (18th to 19th century) was well preserved and provides a wealth of design potential. And that little purse! I know. Little purses like this are readily available in Chinese markets, but small purses from all eras enchant me...I'm fascinated by how they're constructed, what they're made of and how they complement the costume. This little gem satisfies all criteria. 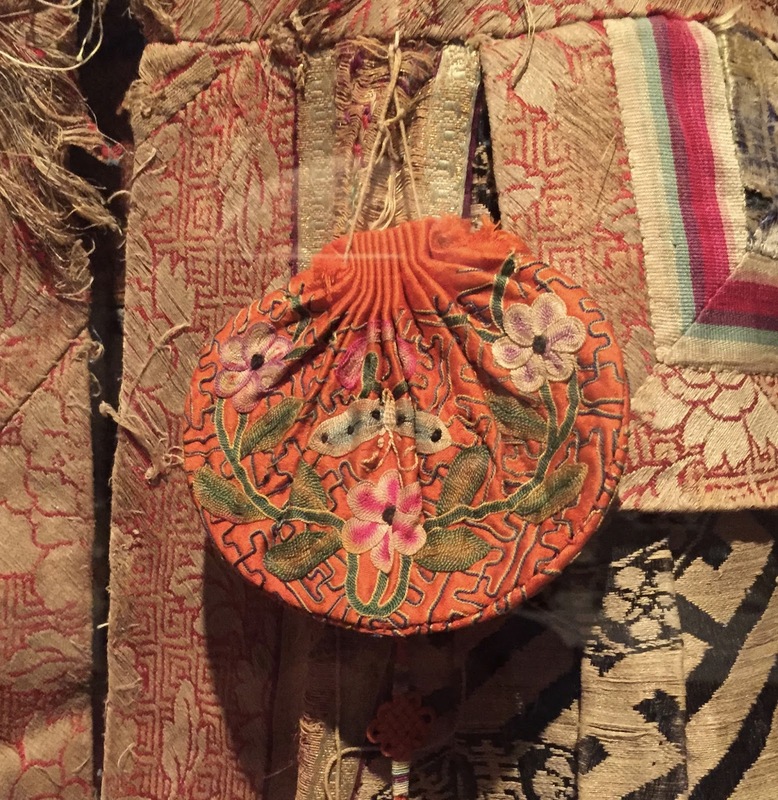 In the same week, we visited the Metropolitan Museum of Art's special exhibit, China: Through the Looking Glass. The two exhibits were bookends. One, the traditional. The other, the influence. I've chosen to share the Genghis Khan exhibit now as it's still at The Franklin Institute (Philadelphia). Go, if you can.